This article is the first in a series of articles written by the graduates of 2018’s Solidarity Academy and re-published in collaboration with Lossi 36. Solidarity Academy is an international project aimed at inspiring and supporting the development of the young intellectuals across Europe. 2018’s Solidarity Academy focused on the borderlands of Central and Eastern Europe, taking on questions of memory, identity and remembrance. Before a young Ukrainian woman named Olga Werbowska, along with other inhabitants, left her native village of Kornie located in the Polish-Ukrainian borderlands, she had put all her energy in conserving her past in a memory book. Knowing that they would have to leave soon, her uncle drew a map with all landmarks of the old village life: the beautiful wooden church, the graveyard and the surrounding houses. She filled her book with pictures, leaflets and other memorabilia from back home. Among them was a little booklet made by the Ukrainian community, listing all 150 family names and villages that were displaced within the Żuławy region in northern Poland. She also took with her an item she treasured most: a ritually embroidered scarf reminding her of her homeland. When I first met Olga to learn more about the Ukrainian community in Poland, she was sitting to the left of me in a living room of her house in the village of Cyganek, located in the Żuławy region not far from Gdansk. For a woman of her age, Olga was moving with a rigorous speed. She had a friendly face, making her appear way younger than she was. With her donning short grey hair and a black and white striped pullover, she buzzed into the kitchen to make tea and coffee and fill us to the brim with cookies. We had heard about Olga from people in the community; she was well-respected and has been living in the area for many years. Olga is one of the people affected by Operation Vistula, which forced thousands out of the Polish-Ukrainian borderland to Żuławy. Operation Vistula was a forced resettlement of the Ukrainian minority from the south-eastern regions of post-war Poland to the “regained territories” in the west and north of the country, implemented by Polish authorities in 1947. During this time, many Ukrainians were dubbed as nationalists, “beasts” and “Banderovtsy”, a derogatory term referring to the followers of the infamous military leader of the Ukrainian Insurgent Army (UPA), Stepan Bandera. UPA, a Ukrainian nationalist paramilitary group operating during the Second World War, was the main perpetrator of the 1943 Volhynia massacre and mass murders of Poles in Eastern Galicia. As a result of Operation Vistula, more than 150,000 Ukrainians were brutally deported to the newly acquired Polish territories, which were formerly part of Germany. Olga Werbowska was one of the many victims of the involuntary population exchange. She was originally displaced to the Mazury district in Poland’s north-east and she moved to Żuławy after her marriage. Her native village of Kornie (Корні), located about 75 kilometres north of Lviv, was seen as a potential cell of UPA support, as it had brought forward a notorious UPA commander, Mikhail Grytsina. During the Operation Vistula Olga was lucky – rather than being forced out immediately, she was given nine months to relocate. Olga knew early on that there were people from her home region who were displaced to Żuławy, but as the community was separated during the Operation Vistula, only years later were they able to find out where their former neighbours were sent to. “It was an open secret, but the communist authorities tried to hide it,” Olga said. Back in the day, Ukrainians could not make up more than ten per cent of any local population. Organising the Ukrainian community life also posed a challenge. “A gathering of more than three or four people could be considered dangerous by the authorities,” Olga adds. This changed only in 1956, when the communist Polish government began permitting small regional activity and let a few thousand Ukrainians return to their homelands in the Polish-Ukrainian borderlands. Previously, many Ukrainians were imprisoned. Those who managed to return, saw their properties already taken over by Poles from western Ukraine brought to the region after 1945, and had no possibility to receive compensation. 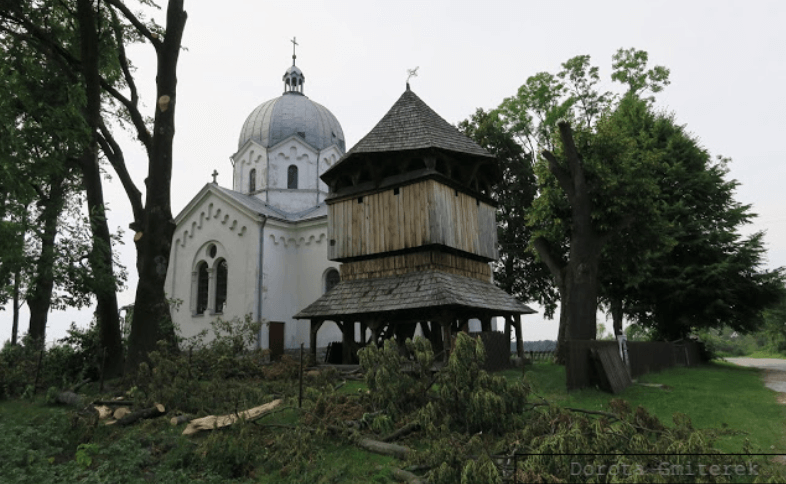 When Olga, her husband and other displaced Ukrainians arrived in the village of Cyganek in the wider Żuławy area, they were offered old and damaged buildings outside the village, often cut off entirely from infrastructure. A rare photograph of the community taken in 1952 at the Cyganek railway station shows them on their way to the church. None of them owned a car back then. With a solemn expression on her face, Olga shows us an old photograph: a traditional village house of a bygone era reduced to ruins. It was her childhood home and the picture was taken when Olga visited Kornie in 1982, 36 years following her displacement. She travelled to Kornie with a group of Ukrainians led by a young Orthodox priest, Father Bunz. They were followed all the way by a Polish border guard, whose official task was to ensure the group’s security. Seeing Olga laugh about this particular memory, I ask whom the guard was supposed to protect. She explains that Ukrainians returning to their ancestral land were sees as a security risk, although the communist authorities would never officially acknowledge that. For Poles living in the villages and towns that Ukrainians were resettled to, their new neighbours invoked old traumas and sorrow. Marek Opitz, a local from the area around Nowy Dwór, remarked that the problem was fostered by the fact that many survivors of the Volhynia massacre were moved to the same region, which put the victims and perpetrators only a stone’s throw away from each other. “The victims knew who the killers were as they recognised their faces,” Marek said. His aunt, an elderly woman who took part in the defence of a Polish settlement attacked by UPA, until the end of her life feared that some of the perpetrators would recognise her. This fear was shared by the survivors’ families, too, as Monika Jastrzębska, a local from Malbork and a child of survivors, explains. “Many people don’t like Ukrainians, even in the second or third generation, and even with the second wave of Ukrainians [recent economic migration to Poland] it can still be a problem in local communities,” she said. Her family was hidden by Ukrainian villagers after the first night of their escape from their home village. When the son of their rescuers turned against them, they again managed to escape, a traumatic experience that made their grandchildren promise them to never go back. In 2016, the ruling Law and Justice (PiS) party in Poland controversially recognised the mass killings of 1943 as “genocide”. Historians estimate the number of victims to be close to 60,000 and often stress that the character of the operations carried out by UPA resembled the previous anti-Jewish operations by the German SS, where victims were murdered with axes. Not even women and children were spared. A local anthropologist from Żuławy, Aleksandra Paprot-Wielopolska, described this past as an “evil history of Ukrainian hateful nationals.” In Żuławy, this difficult memory changed only in the late 1990s, when the Ukrainian community opened its doors and started a dialogue with the local Poles. The new opening came thanks to a new Orthodox priest in the local parish. Overall, attitudes have changed. As Marek explains, especially in the Polish media too much focus is being put on historical conflicts, while much of the everyday peaceful co-existence is rarely talked about. “On the level of community life, there are no problems. People come and go,” Marek said. According to him, the current glorification of UPA in Ukraine has opened new wounds, but there are no anti-Ukrainian sentiments in the area and many people have been openly supporting civic activism in Ukraine, such as the Euromaidan. “Many local activists of the community organised help and were very involved,” Marek said. Relationships have long normalised, and the mayor of Nowy Dwór, a Catholic, is present at every event organised by the Orthodox parish. It seems things have substantially changed for the better. Olga agrees. However, she admits that for a long time “it was better to be quiet” and not to reveal one’s Ukrainian identity. Local Poles often referred to the incoming Ukrainians as “bandity” and “Bandera people,” fearing that the newcomers could disrupt the peaceful village life. The fact that everyone in the area was a settler also helped, as few of the old inhabitants were left in Żuławy. Therefore, it was Polish and Ukrainians creating the new history of the region together; Ukrainians from eastern Poland and Poles from Kielce, Sandomierz, the south of Poland and Volhynia. Nobody was born in Żuławy which made it easier to start from scratch and motivated people to reconnect with the pre-1945 history of the region. When I ask Olga about her dearest memory of Kornie, her face visibly lights up. She says that when she returned to Kornie after 36 years, all the women that came with her began to cry when they approached the former village church and the old cemetery. “It was such an emotionally overwhelming experience to be home for the first time in all these years, seeing the church where I was baptised and the cemetery where my grandparents were buried,” she says. 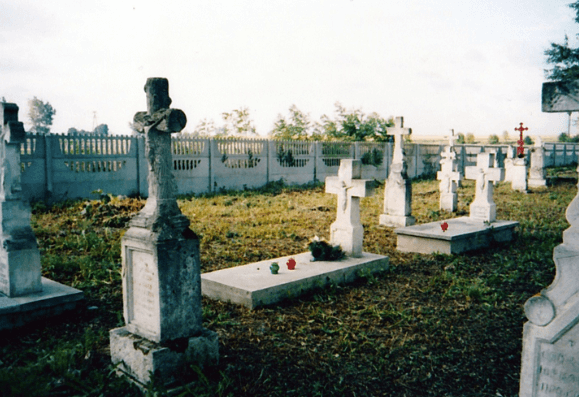 Since the houses Olga and her neighbours were born in ceased to exist, the church in Kornie became the most important point of reference for their memory. 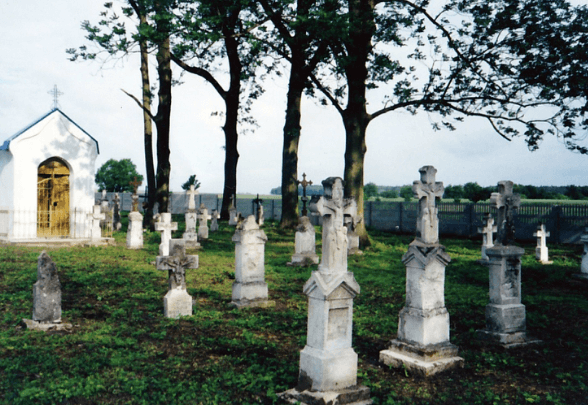 When they noticed that the cemetery was neglected, they collected money, built a fence, and cut the grass covering the graves to restore it as much as possible. “When the local Catholic priest of the parish invited father Bunz to hold a mass in the church nowadays turned Catholic, that’s when we all felt closure,” Olga said. “No eye was left dry, and we were able to let go of the pain of the past.” Buzzing back into her room, Olga comes back with a ritual scarf embroidered in the traditional way which she says belonged to her grandmother. It was one of the few items her family was allowed to take with them. Alexandra Wishart is pursuing her Master’s degree in the CEERES program at the University of Glasgow, Scotland. Holding a BA in Cultural Anthropology and Development Studies, she focuses on matters of culture and ethnicity in the post-Soviet space. She feels passionate about political activism, economy and social movements in Eastern Europe and the Baltic States.